Noor Mohammad, who was arrested by police at Hatsingimari. 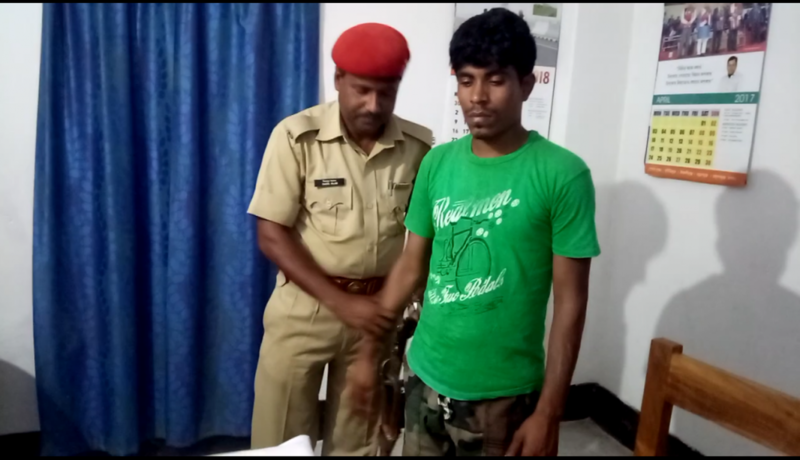 One person was arrested in the late evening on Monday from the Super Market area of Hatsingimari, the district headquarters of South Salmara-Mankachar, after fake Indian currency notes were recovered from his possession, police said on Tuesday. Acting on a tip-off, the South Salmara-Mankachar Police led by a Deputy Superintendent of Police (DSP) conducted an operation at the Super Market area and was able to arrest one Noor Mohammad for carrying fake Indian currency notes (FICNs) with a face value of Rs 20,000. The accused, Noor Mohammad, is the son of Motiur Rahman, who is a resident of Kokradanga village under the Hatsingimari Police Station in the district. Police said all the fake Indian currency notes were in the denomination of Rs 500. Investigation started to find out from where the arrested man got the fake Indian currency notes and to whom he was supposed to deliver those, police said. In an interview with a national news agency, Border Security Force (BSF) Director General KK Sharma reportedly claimed that the trade of fake Indian currency notes trade has been on the decline following the demonetisation and introduction of new India currency notes. The BSF DG also reportedly said that the security features in the new notes are very hard to copy and that is why the amount of FICN seized is not as much as it used to be before demonetisation.